On the 5th November 2014, The Mayor of Dartford Avtar Sandhu MBE will be holding a charity Fashion Charity Fashion Show Show at Heathfields Hall, Dartford. 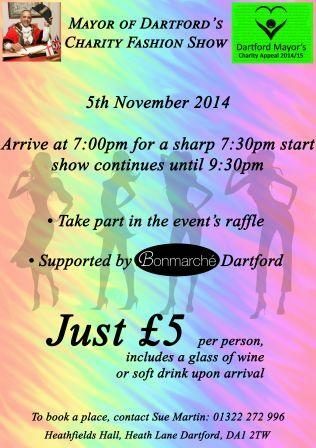 The event is supported by Bonmarche Dartford who will be exhibiting their clothes for your enjoyment. Tickets are £5 per person and include a glass of wine or a soft drink on arrival. The show is from 7.30pm until 9.30pm with arrival around 7pm. As well as a great fashion show, the event will consist of a raffle and you will have a chance to meet the Mayor himself. The Mayor would love to see you all and enjoy a great event.